Provide comfort for the family of Dorothy Nelson with a meaningful gesture of sympathy. 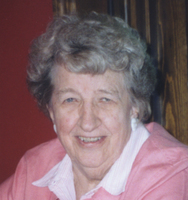 Age 93, of Plymouth, passed away on March 19. She was born a twin on October 21, 1925 in Red Wing. She married the love of her life, Roy, on November 27, 1948. She was preceded in death by parents Amelia and Benjamin Anderson, husband Roy, & sisters Arlin and Dee. She is survived by her children Jeanne (Richard) Walen, Ron (Diane) & Randy (Christy), 10 grandchildren, 8 great grandchildren & nephew Dennis (Pina) Armstrong and family. A memorial service is planned for April 4th at Excelsior Covenant Church, 19955 Excelsior Blvd, at 1 PM. In lieu of flowers, memorials preferred to Excelsior Covenant Church or American Cancer Society.